Whichever course you choose, you’ll need to consider your personal budget before determining what supplies you can afford when shopping at your local art store or online. We have come up with our budgets by finding the recommended items at online retailers. For better bargains, try going to thrift stores, garage and yard sales, or purchase supplies with a friend or two so everyone can share in the cost and materials (and experience!) together. 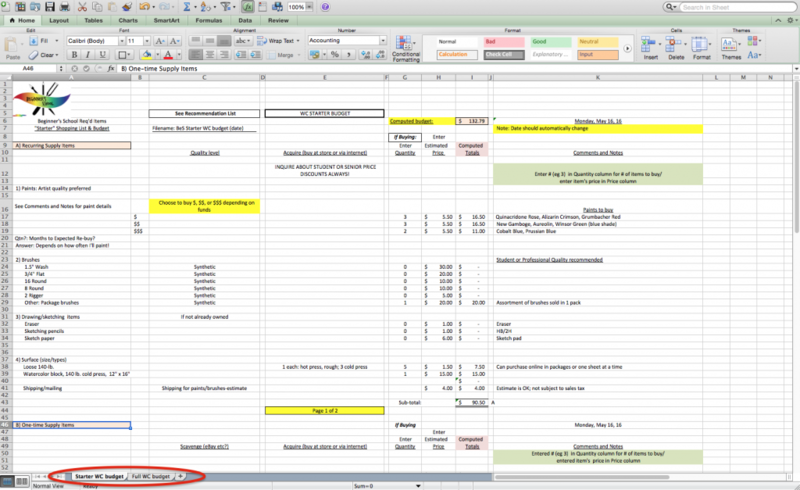 Each of our budget worksheets has both a “starter” and a “full” budget, and you can toggle between them by clicking on the tab at the bottom of the sheet (see tabs circled in red in the photo below). 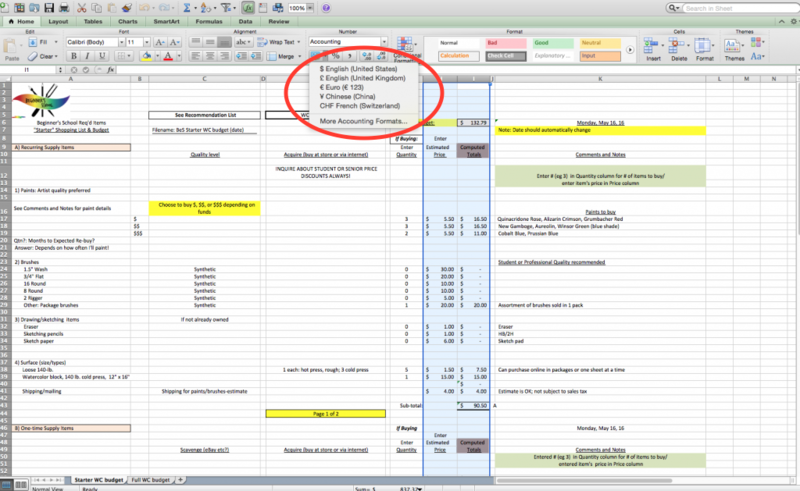 As indicated on the Worksheet, enter the supplies you need under ‘Enter Quantity’ in Column G, and the Price per item in the adjacent column H. The Worksheet automatically computes your budget. See the screenshot below that shows you how to change the currency from US dollars to your currency, after highlighting Columns H and I. Highlight the data you want to format. Click Format Number More Formats. Search in the menu text box to select a format. You can also add your own custom currency format into the text box. You can also change a few properties about the currency (for example, how many decimal places to show) by clicking the drop-down menu in the right corner of the input box and choosing a desired option.